It was a typical southern Victorian summer’s day – cold, windy and showery. 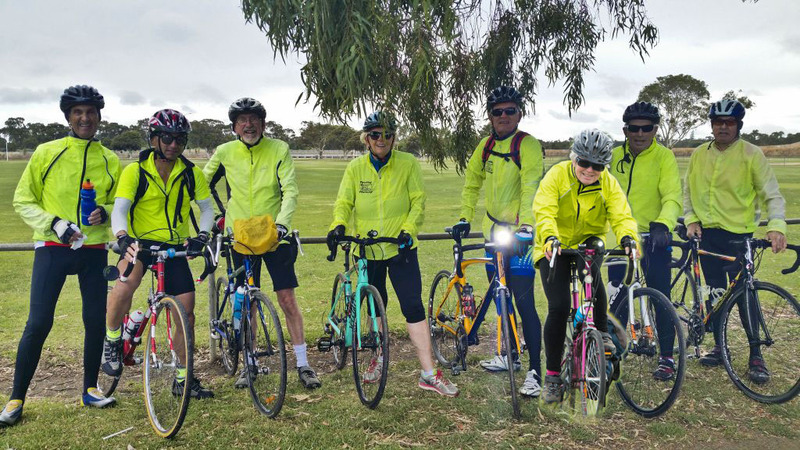 The temperature was tipped to peak at 17, but it never got anywhere near that for the group of 8 intrepid pedallers – John, David, Barbara, Dirk, Helen, Neville and Kelly, ably led by Russell. Due to the inclement weather, Russell modified the route to an out and back to Torquay by the most direct route – Horseshoe Bend Road. Conditions were fair – the strong westerly wasn’t a problem in either direction. Coffee was at Kobo, which is recommended for cyclists, with plenty of room for larger groups and fast, friendly service. There’s a large outdoor area for warm days. The ride was accomplished by 10.30am, with minimum showers. Wet Geelong roads showed that the group had dodged at least one. Thanks to Russell for leading and to John for taking photos near Horseshoe Bend. This entry was posted in Ride reports and tagged Horseshoe Bend Road, Kobo Restaurant, Torquay by hlyth2013. Bookmark the permalink.